The graphic pictures of a turtle and a seal with their heads trapped in plastic were released by conservation group Sea Shepherd for its campaign Operation CleanWaves. 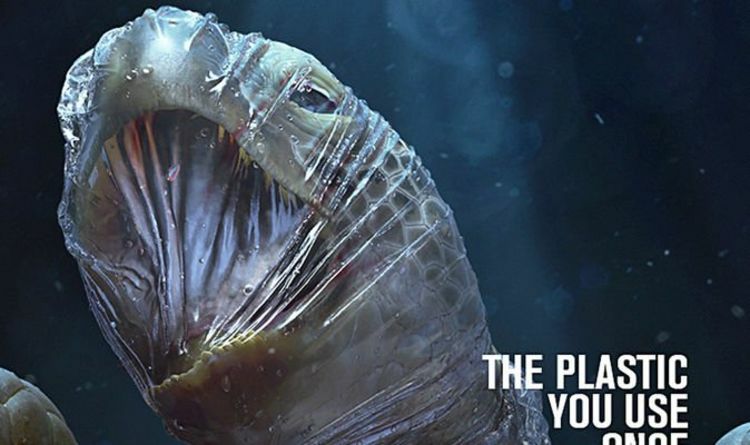 The powerful adverts, which are being shared widely on social media, carry the hard-hitting tag-line: "The plastic you use once tortures the oceans forever." While the images are not real, they serve as a disturbing reminder that sea creatures are being tortured on a daily basis after coming into contact with ordinary items that have been discarded without a second thought. It is estimated that eight million tons of plastic enter the oceans each year. Experts have warned that by 2050 there will be more plastic, by weight, than fish in the sea. At least two-thirds of the world's fish stocks are suffering from plastic ingestion. Sea Shepherd's aim is to halt the destruction and protect our oceans for future generations. The global organisation's founder and president Paul Watson said: "Sea Shepherd is committed to preventing this from happening - because if the oceans die, we die." The group carries out regular beach clean-ups in the UK and worldwide, as well as collecting off-shore debris to study the effects of micro plastics on marine wildlife. The team also find and remove discarded fishing gear from coastal areas. Earlier this week, a whale in the Philippines died after swallowing more than six stone of plastic bags. A post mortem examination found the mass of plastic lodged in its stomach. The waste included shopping bags and rice sacks. The whale was found to have died from starvation and dehydration, with the plastic hindering its ability to feed or digest. Meanwhile, Greenpeace UK is urging Britons to cut down on their everyday plastic use by carrying a reusable bottle and coffee cup with them. In the UK we use more than 35 million plastic bottles every day.